Supporters and mourners thronged the streets to say goodbye to Kim Bok-dong. Seoul (CNN) Kim Bok-dong was brought to the Japanese Embassy in Seoul one last time Friday. 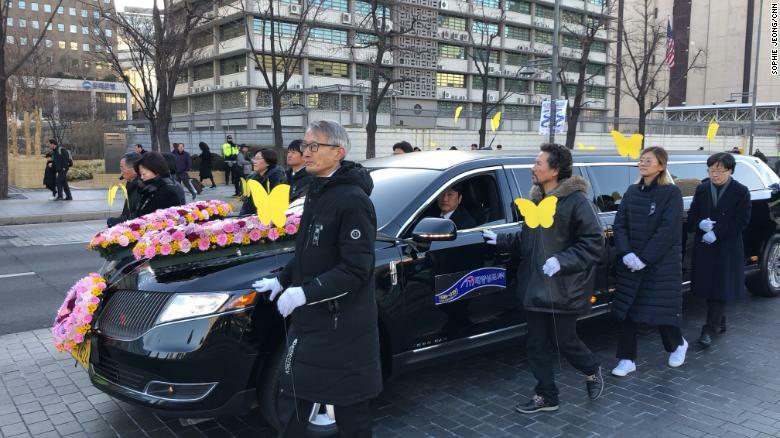 Her casket was driven slowly through the South Korean capital in a funeral procession attended by hundreds of mourners. Supporters braved sub-zero temperatures to say farewell to one of the country’s best known “comfort women.” A wartime euphemism for women and girls, like Kim, who were forced into providing sexual services for Japanese soldiers before and during World War II. Many mourners held banners reading “Our hero Kim Bok-dong” and chanted anti-Japan slogans. On Friday, an emotional ceremony was held in the street next to the bronze statue of a Korean girl that sits watch in front of the Japanese Embassy, a symbol of up to 200,000 women from South Korea and other Asian countries experts say were forced into Japanese wartime brothels. A beloved leader of the “comfort women” protest movement, Kim’s supporters say she died as she lived, her final words a statement of rage against Japan, calling for the fight for justice to go on. While Japan claims the issue is resolved by previous agreements and apologies, South Korean activists say not enough has been done — they demand a more formal apology and reparations from Tokyo. “Kim taught us lessons about what peace is, what human rights are and what it is to hug the weak and the injured,” said Yoon Mi-hyang, president of the Korean Council for the Women Drafted for Military Sexual Slavery by Japan. According to Kim, Japanese soldiers came to her home when she was 14, telling her she would be sent away from Korea to help with the war effort — South Korea was a colony of Japan at the time, and Kim thought she was being sent to a factory. Over the next eight years, Kim was moved around half a dozen countries as the Japanese imperial forces spread out across Asia. After the war, Kim traveled the world again, this time of her own volition, to tell her story and raise awareness of the “comfort women” issue. She even visited Japan. She said she could never have a child because of her experience and Japan had ruined her life. “In my old age, I would not have a single person who could call me mother, I could not have a child,” Kim added. Kim and her supporters repeatedly have called for the Japanese government to admit the wartime brothels were state-sanctioned. Some ultra-conservatives in Japan claim the women worked voluntarily for money. Japanese prime ministers have apologized in the past, and Tokyo believed the issue was settled in 1965 as part of an agreement to normalize relations between the two countries. “I think we did our duty for the current generation by reaching this final and irreversible resolution before the end of the 70th year of the war,” Japanese Prime Minister Shinzo Abe said at the time. But the deal proved to be neither final nor irreversible as former “comfort women” rejected it, saying they had not been consulted. A car carrying Kim Bok-dong’s casket drives through downtown Seoul. South Korean President Moon Jae-in supported their stance when he took power two years later, inviting survivors to the Blue House last year to apologize on behalf of the government. “I want to say I’m sorry to all grandmothers for doing an inappropriate agreement with Japan,” Moon said. He visited Kim in hospital last year as she was being treated for cancer and paid respects at her funeral. There are just 23 known comfort woman who are still alive. Lee Yong-su, 90, is one of them. She attended the funeral Friday to say a final farewell to her friend. The fear among those surviving is there won’t be a resolution to this issue that has soured relations between Japan and South Korea before their time comes. Kim’s passing comes at a time when historically difficult relations between the two countries are badly frayed. Tokyo and Seoul are entangled in a military spat over flybys in the waters off the Korean Peninsula, and analysts have warned it could spiral out of control and drive a wedge between the two nations. CNN’s Sophie Jeong contributed to this report.